The combination of the playful sing-along chorus and a bridge filled with similes forecasts a sweetheart’s indefinite devotion. “Kyndon, actually got the song idea riding along a roadside in Kansas,” Mark Vikingstad (lead guitar) introduced. “I wish the idea was clever, but I just saw a bunch of cows in a field and the thought just came to me…wouldn’t it be grand to be in a relationship ‘til the cows come home,” added lead singer, Kyndon Oakes. 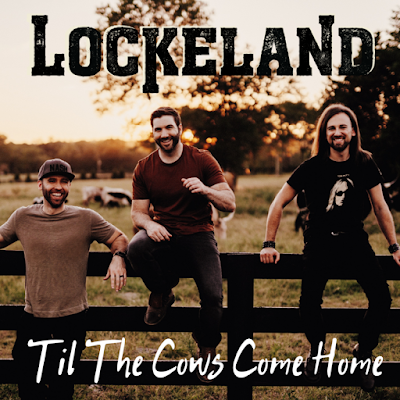 “I feel that this track really demonstrates the key elements of Lockeland...Our three-part harmonies, high-energy performance, affinity for clever lyrical hooks and phrases, and our mutual sense of humor. 'Til The Cows Come Home' is a fun, witty love song that we hope listeners will crank-up and sing along!" said Lockeland drummer and co-producer, Michael Boris. "The production showcases the smooth, yet soaring elements of our three part vocals as well as the rockin’, high energy of the instrumental performances. Our goal is to give the listener a fun, witty love song that they can crank up to eleven in the car, with the windows rolled down, cruising on an open highway with the one they love in the passenger seat.” said Lockeland drummer and co-producer, Michael Boris. Marco Promotions and Jerry Duncan Promotions will team to spearhead the “Til The Cows Come Home” country radio promotion campaign Lockeland is also slated to participate in CRS-50 (Country Radio Seminar/February 13-15, 2019) in Nashville. The single will be available via major digital retail and streaming outlets (Amazon/iTunes/Pandora/Rhapsody/ Spotify) on Friday, March 8, 2018. Digital retail distribution services will be provided by Ed Gertler/Digital Delivery Services.